Fushigi no Dungeon: Fūrai no Siren 2: Oni Shūrai! Siren-jō! 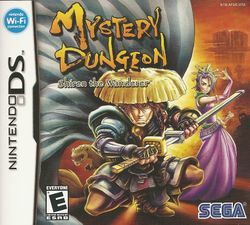 Mystery Dungeon: Shiren the Wanderer (不思議のダンジョン２ 風来のシレン Fushigi no Dungeon 2: Fūrai no Shiren) is a graphical Roguelike by Chunsoft. It is the second game in the Mystery Dungeon series, and the first game in the series to feature all original characters. It was originally released for the Super Famicom in 1995, and has subsequently been ported to the Nintendo DS. A sequel, Fushigi no Dungeon: Fūrai no Siren 2: Oni Shūrai! Siren-jō!, is available for the Nintendo 64 in Japan. Shiren the Wanderer 3 was released on June 5 in Japan for the Wii. In September 2007 Sega announced that they would release the DS version in North America on March 4 2008. Although "Shiren" is the name of the primary character, the Japanese title is a pun; while "Shiren the Wanderer" is the official English title for the game, "風来のシレン" can also translate as "The Wanderer's Ordeals". The game takes place in a fantasy version of feudal Japan, and stars a ronin named Shiren and his companion, a talking weasel named Koppa, on a quest for the Land of the Golden Condor. This page was last edited on 5 February 2019, at 12:45.